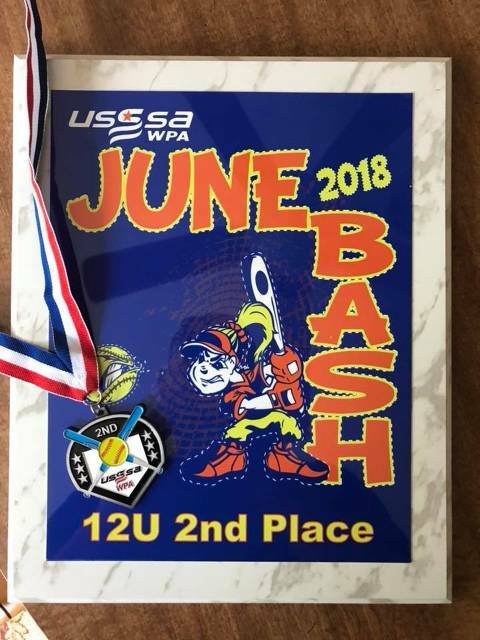 The Northern York Fastpitch Association’s (NYFA) 12U Polar Elite Softball Team completed its 2018 season by going 5-0 and winning the Summer Spectacular in Greencastle, PA. Pool Play Game 1 - Polar Elite 5, Maryland Rebels 4. The tournament got off to a shaky start as the Rebels grabbed a quick 2-0 lead in the first on a single, two errors and a fielder’s choice. The Polar Elite got one back in the first as Emily Randalls (walk) stole home. Natalie Hunt singled in the second to score Karla Elicker before Allison “Gator” Aschenbrenner (single) scored on a wild pitch. An error allowed a third Rebel run to score but NYFA answered quickly as Elicker singled scoring Tayler Yoder in the third. With two out in the top of the fifth, the Rebels tied the game on an error and a triple. With time winding down, Yoder lead off the bottom of the fifth with a single and immediately stole second. Keira Devor walked, Elicker was intentionally walked setting the stage for Aschenbrenner to line a game winning, walk off single to right. Devor earned the win pitching five innings allowing three hits, four unearned runs and striking out seven. The Polar Elite bats came to life in game two scoring 10 runs on seven hits. Hunt led the team with three hits, Yoder had two. Jessica Li drove in three runs while Yoder and Sarah Turner each drove in two. Hunt earned the win pitching a complete game allowing one hit, one run while striking out six. The Lightning started fast in the first taking a one run lead on an error and a fielder’s choice. The Polar Elite answered on a sacrifice fly by Li scoring Randalls (hit by a pitch). NYFA put the game away in the bottom of the second scoring 12 runs, on ten hits highlighted by an inside the park home run by Hannah Galbraith, triples by Aschenbrenner and Turner and doubles by Lane and Hunt. Galbraith scored on an error in the third ending the game via mercy rule. Lane earned the win pitching two innings of no hit ball and striking out five. NYFA entered championship play as the top seed drawing the Lightning in game 1. After a scoreless first, the Polar Elite scored four times in the second. Aschenbrenner tripled scoring Turner (walk) and courtesy runner Ashley Miller. Hunt singled to score Aschenbrenner and later scored on an error. In the third, Aschenbrenner tripled again scoring Yoder and Emmalee Mowery to make the score 6-0. Li and Lane would drive in three more runs in the fourth before Miller scored on a wild pitch to end the game via mercy rule. Lane earned the win pitching four innings allowing only 1 hit while striking out four. The Polar Elite would face the Rebels again to determine the tournament champion. The Rebels scored in the top of the first on two hits and fielder’s choice. With two outs in the bottom of the first, Lane singled scoring Li and Miller to give NYFA a 2-1 lead. The Rebels tied it in the second on a single, double and a fielding error. In the third, Li (singled) and scored on a dropped fly ball hit by Yoder. In the fifth, Li was at third base and attempted to score on a wild pitch. However, the ball bounded off the back stop and right back to the catcher. Great base running by Li allowed her to eventually steal home after a lengthy and exciting rundown. Courtesy runner Galbraith scored in the bottom of the sixth on a hard hit ball by Hunt. In the top of the seventh, the first two Rebel hitters singled. However a strikeout, a fielder’s choice and a great leaping catch by Randalls at first base secured the game and the championship for the Polar Elite. Devor earned the victory pitching seven innings allowing nine hits, one earned run with six strikeouts. 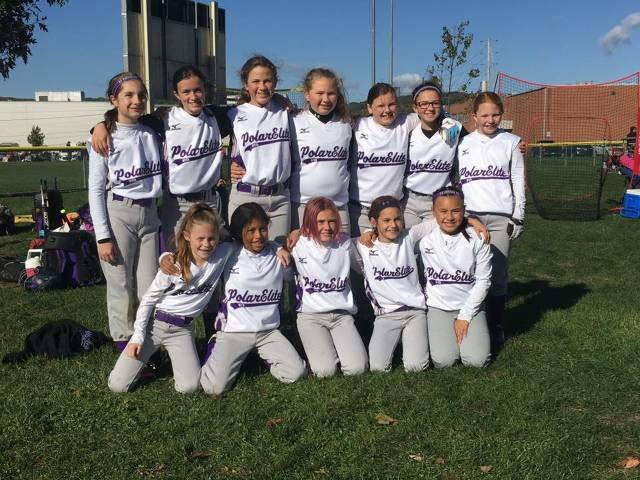 This season, the Northern York Fastpitch Association’s (NYFA) 12U Polar Elite Softball Team’s fiercest rival has been Mother Nature. After winning their first two pool play games, Mother Nature took over dumping inches of rain on the complex and cancelling the remainder of the 2018 Howard County Summer Sizzler tournament in Ellicott City Maryland. Pool Play Game 1 - Polar Elite 10, Lakeshore Lightning 0. Natalie Hunt singled to start the game and scored on a steal of home giving the Polar Elite a one run lead in the first. In the second, with two outs, Hunt singled again, Emmalee Mowery walked and both runners scored on three run inside-the-park home run by Jessica Li. In the third, Sarah Turner, pinch running for Keira Devor (single), scored on Ashley Miller’s inside-the-park home run giving the Polar Elite a 6-0 lead after three innings. In the fourth, Hannah Galbraith walked and scored on NYFA’s third inside-the-park home run of the game, this one by Eliza Lane. In the fifth, Miller singled scoring Turner and then scored on a single by Hunt. Devor earned the win pitching five innings allowing only three hits. During game two, conditions were tough as the game was played during steady and at times heavy rain. All pitchers struggled to grip the ball effectively. Four walks, a wild pitch and a fielder’s choice allowed the Tsunami to take an early 2-0 lead. In the bottom of the first, the Polar Elite scored five times as Miller hit a two run single scoring Hunt and Mowery. Li and Miller would score on wild pitches and Lane scored on a Turner single. In the second, Li reached on a fielding error and scored on Miller’s second inside-the-park homerun of the day. In the third, Devor singled scoring Hunt (single). Galbraith, running for Devor, would score on a Li triple. Li then scored on a wild pitch. Hunt, Lane and Devor all pitched in the game with Lane earning the victory throwing 1.2 innings of hitless ball, striking out three. Depending on weather and field conditions, the Polar Elite plans to play their final tournament of the season this weekend in Chambersburg. For the first time in nearly two months, the Northern York Fastpitch Association’s (NYFA) 12U Polar Elite Softball Team played two consecutive tournament days without any rain. Playing at the 2018 Summer Jam NIT in Sterling, Virginia, the Polar Elite finished 2-2 against some very good competition. Game 1 - Polar Elite 7, TriState Thunder 0. The Polar Elite started fast in Game 1 against the Tri State Thunder scoring three runs in the top of the first as Emily Randalls, Jessica Li and Hannah Galbraith all walked. Eliza Lane hit a sacrifice fly scoring Randalls before Tayler Yoder doubled to left scoring Li and Galbraith. In the second, Emmalee Mowery and Natalie Hunt reached on fielding errors, Sarah Turner walked, and with two outs, Galbraith tripled to right clearing the bases for 6-0 lead. In the fourth, Lane scored on a bases load walk. Keira Devor threw a complete game shutout allowing only three hits while striking out six. Game 2 - Polar Elite 4, VA Xplosion 3. Game Two was close throughout and eventually became a walk off win for the Polar Elite over the VA Xplosion. Again, NYFA started fast in the first as Hunt singled and scored on an RBI single by Ashley Miller. In the second, Turner walked, Karla Elicker singled and Allison Aschenbrenner knocked in both runners with a single to center. The Xplosion came back scoring once in the third, and with time running out, and two outs, they scored twice in the top of the fourth to tie the game at three. As the home team, the Polar Elite had one more at bat to try and win the game. In the bottom of the fourth, after two outs, Hunt walked and stole second base. She scored the winning run on a Devor infield single and an Xplosion throwing error. Hunt was the winning pitcher throwing four innings, allowing three earned runs, five hits and a strikeout. Game 3 - Magic 3, Polar Elite 0. In Saturday’s third game, the Polar Elite played the eventual tournament champion Cumberland County Magic. In this game, NYFA faced the best pitcher they’ve seen all year. She threw hard, had a very good changeup and was backed by an excellent defense. After two outs it the first, the Magic put together three consecutive hits to score a run. After a scoreless second, again the Magic put together another series of three hits to score. In the third, same story, with two outs, a hit, a sacrifice bunt and another single scored a third run. NYFA’s best scoring chance came in the third as Li tripled to right center. Aschenbrenner, pinch running for Li, was thrown out at the plate trying to score on a Galbraith groundout. NYFA pitched well, defended well and put the ball in play however, the balls put in play by the Magic found grass and dirt, while ball it by the Polar Elite mostly found gloves. Game 4 - Northern Calvert Fury 9, Polar Elite 3. The Polar Elite entered Sunday’s single elimination Gold Bracket championship tournament as the eighth seed facing the number one seed Northern Calvert Fury. NYFA jumped out to an early lead in the first as Hunt singled and scored on a Galbraith groundout. In the second, Yoder and Devor singled and scored on a two run single by Turner. However, the game turned the bottom of the second as the Fury scored four times to take the lead on a walk, three hits and an error. The Fury then pulled away scoring three times in the third and twice in the fourth on four hits, two walks and a couple of errors. The Fury would lose to the Magic in the Tournament Championship game. Rain, Rain go way, please let us play another day! two wins and run differential, the Polar Elite were awarded second place for the weekend tournament. a hit by Emmalee Mowery. After half an inning, it was 4-0 Polar Elite. found gloves as Devor had the only other hit in the game. Final score: 4-0 Polar Elite. bottom of the second on a fielder’s choice ground out. giving the Polar Elite a 4-3 lead after two and one half innings. third hit of the game. pitched the final two innings allowing no hits with two strikeouts. Final Score: Polar Elite 5, Terror Fastpitch 3.
innings giving up just three hits, one run while striking out five. three hits each. Devor, Tayler Yoder, Turner and Miller contributed hits as well. 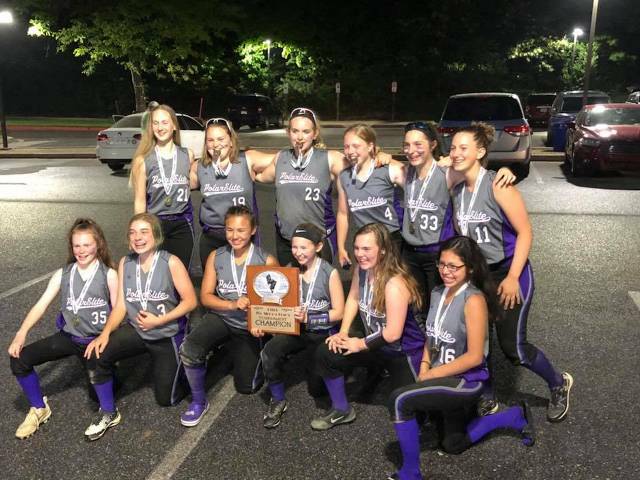 Playing in their first sanctioned United States Specialty Sports Association (USSSA) tournament of the year, the Northern York Fastpitch Association’s (NYFA) 12U Polar Elite Softball Team went 4-0 and was named the 2018 Mamma Drama Tournament Champions in Columbia Maryland. In game 1, the Polar Elite faced the Hughesville Hustle—the number one ranked 12U softball team in Maryland—and grabbed an early 2-0 lead in the top of the first on a two out double by Eliza Lane. In the third, Lane singled home Emily Randalls making the score 3-0. In the fourth, the Polar Elite broke the game open with five runs highlight by a two run single by Ashley Miller, another RBI single by Lane and an RBI double by Kiera Devor. On the mound, Devor attacked the Hustle hitters throwing 67 percent of her pitches for strikes while only allowing one run on four hits in the five inning game. Game two was a contest between the Polar Elite and the Maryland Express Fire. In the top of the first, the Polar Elite scored twice as Allison Aschenbrenner singled home Natalie Hunt and later scored on an Express Fire error. In the third, The Polar Elite scored three times as Jessica Li drove in Karla Elicker, Hannah Galbraith drove in Sarah Turner and a Randalls single scored Galbraith. On the mound, Hunt pitched four innings, giving up three runs on three hits while striking out eight. With Devor throwing more strikes on the mound in game three, The Polar Elite dominated the Maryland Fever by a final score of 12-2. Hunt led the offensive attack with four hits and three RBI’s. Randalls drove in a career high four runs. Miller and Devor each had two hits while Emmalee Mowery, Taylor Yoder, Li and Turner all contributed to the 13-hit attack. In the tournament semifinal game, The Polar Elite faced the Lady Outlaws from Hanover. Hunt dominated from the circle as she struck out eight while allowing just one run on three hits over five innings. After a slow start, the offense came alive led by Galbraith who went two for three driving in three runs. Li, Turner and Yoder also drove in runs leading the Polar Elite to a 7-1 victory. As seven pm approached, so did thunderstorms resulting in the suspension of the other semifinal game led by Hughesville in the final inning. After a nearly two hour weather delay, the Polar Elite were declared the tournament champions due to their 4-0 record and their earlier victory over Hughesville. 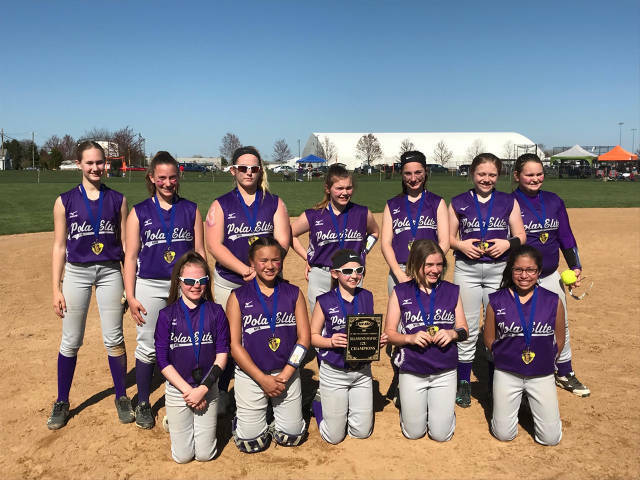 The Northern York Fastpitch Association’s (NYFA) 12U Polar Elite Softball Team dominated its competition by a combined score of 78-5 to win the 2018 Diamond Havoc Softball Tournament hosted by In The Net in Palmyra. Weekend offensive leaders included Ashley Miller, (8-11, 7 RBI’s), Eliza Lane (9-15, 9 RBI’s), Tayler Yoder (8-14, 9 RBIs), Sarah Turner (6-11, 6 RBI’s) and Kiera Devor (8-15, 10 RBI’S). The pitching staff was led by Devor (2 wins, 10.2 Innings pitched (IP) with 14 strikeouts), Natalie Hunt (2 winds, 6.0 IP, with 12 strikeouts) and Lane (1 win, 3.1 IP with 6 strikeouts). The team will be traveling to Laurel, Maryland, the Lehigh Valley, Chambersburg, Sterling, Virginia and Columbia, Maryland in May and June.